Information is compiled using regional print and online plant registers and reference materials. TimTec Plant Extracts is the collection of crude mixtures extracted from different parts of plants sampling the flora of Eastern Eurasia. 2. Extracts available from US stock. About 130 extracts are randomly selected to represent geographical diversity and include different plants and also different parts of the same plants. 4. Custom Extraction from plants to-be-collected. 9,000 plants are on this list. 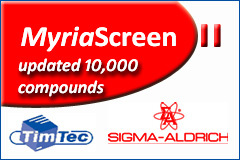 Present advances in screening and separation technologies reveal extracts bioactivity with great efficiency and accuracy. Recently reported method of Direct Screening of Natural Products Extracts Using Mass Spectrometry does not require any preparation or fractionation work. 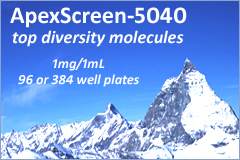 Several hundred crude extracts can be screened per one day. Direct bioaffinity screening mass spectrometry method followed by the use of ligand mass information for mass-directed purification makes screen of crude extracts and identification of active compounds precisely possible. Price - depends on the collection region, amount of extract, number of extracts from one sample, solvents used for extraction and procedure. Please contact us for current prices. Delivery time Ã¢â‚¬â€œ normally 5-6 months if the product is not in stock and collection is necessary. The collection season starts in April and ends in October. The collected plant material (plant parts: stems, leaves, flowers, roots, bark etc.) is dried in a ventilated oven at 45 oC for 24 H, and subsequently milled to a fine powder by means of an IKA Universal Mixer M20 (or other type). 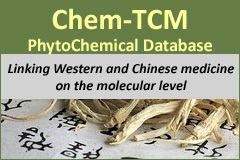 An amount of 20.0 g of the dried plant powder is weighed in an Erlenmeyer of 100 ml to which 70 ml of hexane (purity grade 99 %) is added (the plant sample has to be submerged with solvent) for pre-extraction. The Erlenmeyer is placed in a sonicator-bath (Branson 8210 or some other type) and sonicated at a temperature 40 oC during 30 minutes. The mixture is filtered using paper filter, followed by washing the Erlenmeyer with 20 ml of hexane and then with 50 ml of hexane. The filtrate is poured in a round-bottomed flask and the solvent is concentrated in vacuo (at about 11 mm Hg) up to 5-10 ml by means of rotavapor, utilizing a water bath at 40 oC. This residue is brought in a 30-ml vessel to let the solvent evaporate. The open vessel is left overnight in a well-ventilated hood in order to evaporate the last traces of the solvent in the hexane pre-extract. The solids, collected on the filter, are broken up and dried in the air overnight in the hood. The dried material is extracted in the same way with methanol-water (90:10). The dried material from the filters placed in an Erlenmeyer of 100 ml to which 70 ml of 90 % methanol is added. The mixture is sonicated as above at 40C during 30 minutes, after which it is filtered, followed by washing the Erlenmeyer with 20 ml of 90 % methanol. The filtrate is poured in a round-bottomed flask and the solvent is evaporated in vacuo completely. The dry 90% methanol extract is dissolved in as little as possible 100 % methanol by using the sonicator-bath and poured in a 30-ml vessel to let it evaporate overnight in the hood.